Write up courtesy of ‘Bit of Bully Darts’. Yesterday, Jack Male travelled to Chesterfield for the England Darts Youth event. Jack had already tasted success in these events, where he won one event out of the three he played last year, in Gateshead. 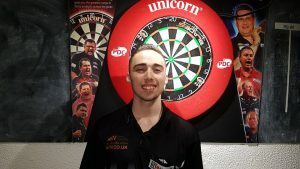 In his group stage, Jack won 2 of his 3 group games (3-0 against Eleanor Cairs and a 3-0 against Tavis Dudeney), narrowly losing to Henry Coates 3-2 after missing darts to win from 2-0 down. However, other results meant he still finished top of his group. The last 32 saw Jack take on Holly Meadwell, who he despatched 3-0 with some high scoring and solid finishing. The same score lines followed in the last 16 and quarter finals, against Reece Pauling and Dalton Storr, respectively. Jack fired in finishes of 156 and 157 on the way. In the semi finals, Jack faced Luke ‘The Nuke’ Littler, seeking revenge after Luke recently beat him at a JDC tour event. Jack moved past Luke 4-1 and moved into the final. 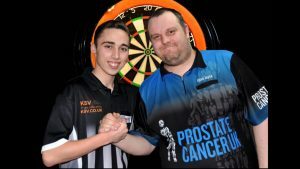 In the final, Jack faced JDC European Champion Brad Phillips, in a repeat of Jack’s final win last year. It was nip and tuck all the way through with both players at a very high standard, but just like he did last year, Jack emerged victorious with a 5-3 win. 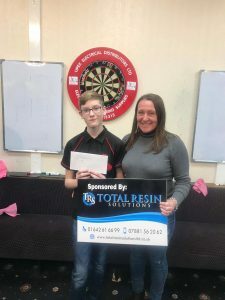 In his first England event of 2019, Jack masked the best start he could do in the hunt to make the finals at the end of the year, which he finished runner up in 2018. Following on from their fantastic ‘Grand Slam Pairs’ victory in 2018, Harry Robinson & David Gradwell went all the way in the Pairs comp at Sky Lounge on Saturday. The day consisted of 24 pairs split into 4 groups of 6. Each pair had 5 group games, with the top 2 qualifying for the knockout stages. In the groups, Robinson & Gradwell won all 5 games only dropping 3 legs en route to the knockouts. They faced Runners up in Group C, McDine & Lawson in the quarters and defeated them 4-1. Already proving to be the strongest pair on the day, they carried on their form into the semi finals, despatching Matthews & Craig Anderson before facing their group runners up In the final. 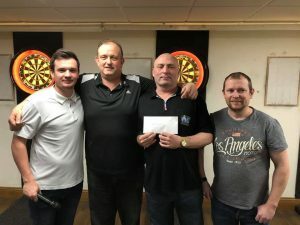 It proved to be a much tighter affair than the group game, however, they dug deep and defeated Shanks and Rydz to take the title and the £400 first prize. Lastly, a big shout out to Matthew Hodgson who kept the competition running as smoothly as possible and supported me throughout the day. Another great competition was held at Sky Lounge in Washington on Saturday 30th March. With only 4 days notice, the competition attracted 51 players with some of the best talent in the region taking part. Kev McDine was too strong on the day, as he despatched Craig Anderson in the quarters before beating Ryan Joyce 5-1 in the Semi Finals. The final saw him up against Tony Wood. The tie went the distance, with McDine edging out Wood in the decider to take the win. 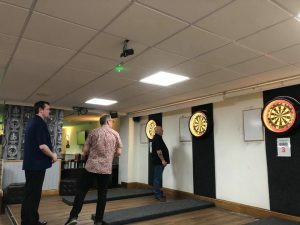 On Tuesday 19th March we were treated to a fantastic night of darts, with the 32 Man Invitational Darts Event consisting of the finest talent in the region. 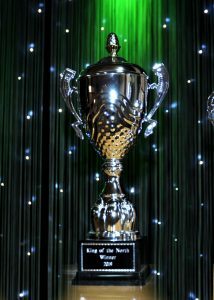 The event consisted of a straight knockout with the winner taking home £800 First Prize, Winners Trophy and title ‘King of the North’. The early rounds consisted of best of 9, with the final best of 11. 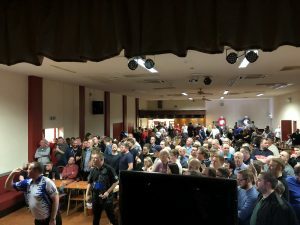 With just shy of 200 spectators there to witness the likes of Glen Durrant, Chris Dobey, Ryan Joyce and Adam Hunt battle if out in an FA Cup Style Draw knockout, to take the bragging rights of the best player in the North, it was a night to remember for everyone who attended Shotton Comrades Club. Firstly, well done to all participants who accepted their invitation and put £50 on the line to compete. The field consisted of Professionals, County Players and players who have competed at the highest level over the years, making it a great show for those that attended. Photo Credit(s) – Fergus Easton – For all your photography needs visit his page HERE. The evening kicked off with a live draw and it certainly did not disappoint, as Glen ‘Duzza’ Durrant was drawn out against World Number 35, Chris ‘Hollywood’ Dobey. The magic of the FA Cup did not let us down! As you can see with the picture below, it attracted quite a large crowd. The darts the crowd witnessed were worthy of any TV competition, with both Chris and Glen producing great darts. Glen took an early 3-0 lead in 13, 14 and 16 darts. Chris battled back, but Glen was in fine form, breaking again with a 14 dart leg to take the lead 4-0. Glen missed 2 match darts and Chris capitalised with 108 checkout to make it 4-1. However, the 3x BDO champ prevailed, wrapping the match up in 16 darts. Duzza averaged just shy of 100 including 3x 180s. Moving into the last 16, with the losers picking up £50, therefore winning their money back, the draw certainly didn’t disappoint again, with Durrant facing Ryan ‘Relentless’ Joyce. 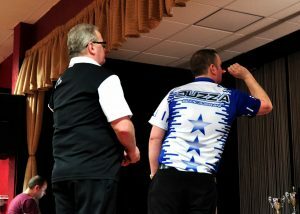 Again, this match attracted the crowds, but the match was a little closer, with Duzza edging out Joyce in a 5-4 thriller. 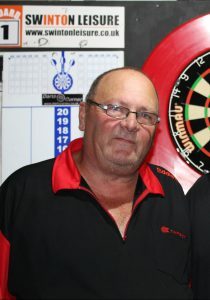 BDO Ranked Number 3, Allan ‘The Rock’ Edwards started off in fine form as he defeated Kev McDine first round before despatching Dave ‘The Badger’ Prins in Round 2. As we moved into the quarter finals, with a fair share of players qualifying under the radar as a handful of big hitters were dumped out early doors. PDC player, Terry Temple only dropped 2 legs in his two opening games, against two great players in Tony Wood & Keith Wright. 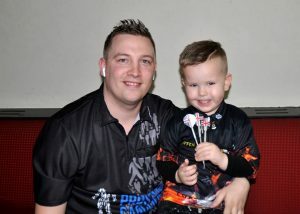 However, he was tested in the quarter finals as he faced UK Open Qualifier, Kev Thoburn. 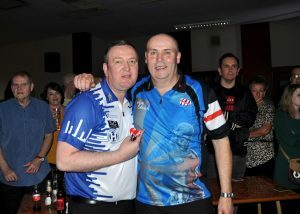 Another great game for the spectators, with Terry edging out Kev in a 9 leg thriller. 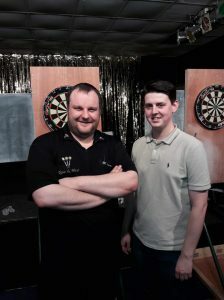 Glen faced another PDC Player in Adam Hunt, as he faced one of the hardest routes to this stage. Both Glen and Adam held throw early doors, before Glen capitalised in leg 4, to break and lead 3-1. That early break proved to be clinical as he went onto win the game 5-2 and book himself in the semi finals. 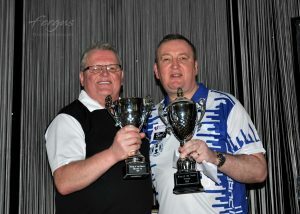 As we neared the business end of the competition, the live draw again did not let us down as Durrant faced good friend Allan Edwards in the semi finals, but proved too strong for ‘The Rock’ and made sure in fine fashion. In the other semi final, ‘The Terminator’, Terry Temple whitewashed Paul Jennings, 5-0. Moving onto the stage for the Final, with Matthew Hodgson on the computer and MC Joe Goodison hosting the evening, both Glen and Terry were welcomed onto the stage with walk on music for the crowd. 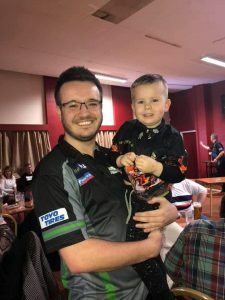 Glen was joined by his young fan ‘Kai Tiffen’, who proved to be a big hit with all players and spectators, as seen below in the selected photos! The game got under way with Joe Goodison calling and both players produced great darts. En route to victory, Duzza took out 167 on the bull to get the crowd up on their feet. 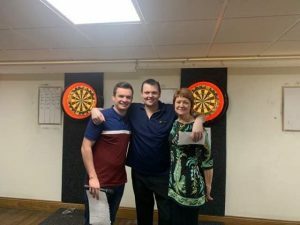 A fantastic night, with Glen ‘Duzza’ Durrant crowned ‘King of the North’ and taking home the winners prize money of £800. Lastly, a big shout to all those that helped make the night a success, to the organiser, Dave Prins, to those that marked on the evening, to those that helped raise a fantastic amount of money for the charity, ‘Little Treasures’ and helped with setup/takedown! 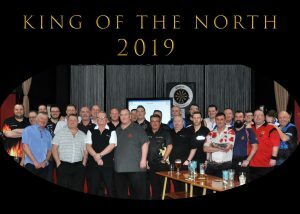 A huge success and we are all looking forward to King of the North 2020. There were two competitions this weekend, with both over 50 entries. 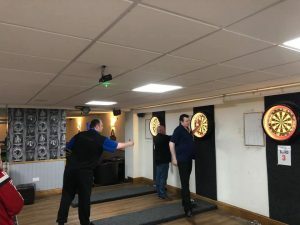 Saturday’s competition was held at Wolsingham WMC with Eddie Mordica carrying on his fine form to defeat Richie Archbold in the final. On Sunday we were at Houghton Comrades Club with ‘Relentless’ Ryan Joyce defeating John Kippen in the final. Great day at Houghton with big hitters in attendance. Good to see a good mixture of youngsters coming through and challenging the regulars on the circuit. Cracking venue for darts and superb hospitality, with free pizza for all attendees! 15, 14, 13, 18, 14, 21 darts. 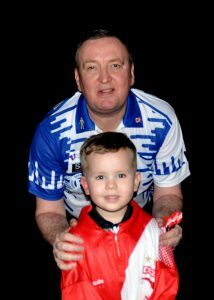 Northumberland’s Kev Thoburn has qualified for the PDC UK Open 2019. 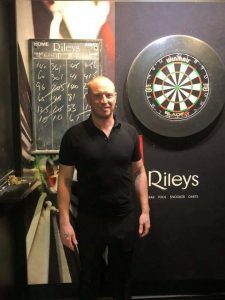 He battled his way through the Riley’s Nottingham qualifier defeating Ritchie ‘Madhouse’ Edhouse in the final. The UK Open will take place 1st-3rd March at Butlin’s Minehead, live on ITV Sport. In the biggest move since the tournament was introduced in 2003, the PDC will be abolishing the UK Open Qualifiers for professional players which had previously been used to determine 96 qualifiers. 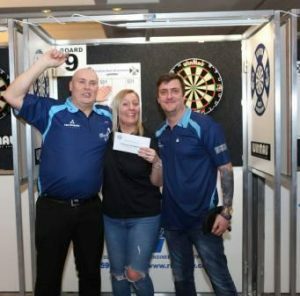 All 128 Tour Card Holders will now be invited straight into the UK Open from 2019 onwards, with the field complemented by 16 Rileys Amateur Qualifiers and 16 qualifiers from the 2018 PDC Unicorn Challenge Tour Order of Merit. Another fantastic day at the Sky Lounge in Washington. A venue that has it all for sports fans, with 22 TVs, snooker tables, pool tables and more importantly, a great darts setup! After last year’s 118 entries, we brought in some new boards to make sure it ran as smoothly as possible. This year we had 116 entries and plenty of new faces travelling from afar to compete. Kicking off the day, there was a tasty matchup in round one, with Kevin McDine defeating David Gradwell. Also, in round one we saw Stephen Mallams narrowly defeated by Alan Davie, but Mallams picked up the highest checkout prize of £80 with a 160 checkout (best on the day). Moving into the last 8 we saw the games heating up and the big hitters facing each other, with Ryan Joyce beating Kevin McDine 4-2. 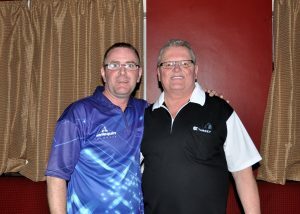 Tony Wood defeated fellow super league player Ste Addison 4-1 in another great match up. En route to the quarters, local lad Graham Dennison defeated some great players such as Dan Mock and James Forster before despatching Alan Davie 4-1 to set up a semi final against Ryan Joyce. In the last 64, youngster Jack Male battled through a fantastic game with Ian Gleeson that had everyone glued to the board. Jack was in fine form on the day and knocked out some top players en route to the semi final. The young Tyne & Wear hitter faced Tony Wood, who has been in fine form as of late and the match didn’t disappoint. A best of 7 game that went the distance and Male produced some great darts to despatch Mr Wood and put him in the final against Ryan Joyce. A short break before the final, the stage was set and still a load of people in the venue to witness Joyce v Male. 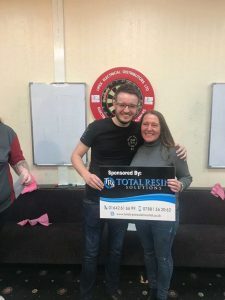 ‘Relentless’ showed his class by beating ‘Maestro’ 5-0 and being crowned Sky Lounge Winter Open Champion 2019. Jack Male picked up both the runners up prize money and the furthest youth on the day, a great day all round for the young lad. Thanks to David Castledene for calling the final and Andy Parks for marking it. 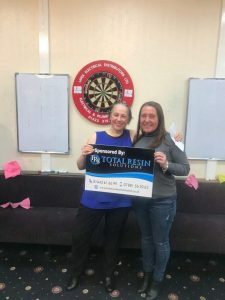 Darts is a great sport to unite people and yesterday proved that, with players and spectators travelling from far and wide to attend and was a great atmosphere the whole day. Thank you to David Ball and Marc Farnsworth from the Sky Lounge for putting in £600 towards the prize pot, highest check out and furthest youth prize. Thank you to Jen and the Sky Lounge staff for the great service and lastly thank you to Andy Allaker, Stephen Bainbridge, Gerry Grieve, Scott Collingwood, Matt Hodgson, Marie Carline and Fergus Easton for their help yesterday (and today for takedown), without you lot, these competitions would not be a success. We look forward to bringing more big competitions to the North East!